Inside the studio...what a creative transformation of metal clay! 'I create precious metal clay. It's a unique medium that allows you to mold the clay into any shape you want to, and imprint any texture that you would like to as well. Once dried and sanded, it is fired in a kiln at a very high temperature, where it undergoes a sintering process. The metal clay essentially sinters into metal. After more sanding, buffing, and sealing, the piece is complete." "Glass fusing involves stacking, or layering thin sheets of glass, using different colors to create patterns or simple images. The piece is then placed inside the kiln and heated until the separate pieces begin to bond (fuse) together. This is achieved at a temperature of about 1490 degree. The glass is then either, placed in a mold and re-fired (slump) to give it the shape of plates, bowls, candle holder etc. or cut, polished and re-fired to create unique pieces of jewelry." Beauty secrets of Pampered Pooches revealed! When it comes to dogs with dye, one dog comes to mind: @tiffanythepommie. We spoke with her humans to ask some of the questions we thought would be useful to those who are considering this. Enjoy! What made you decide to dye Tiffany's hair?Oh boy that’s a hard one, I can’t really remember. I think it was my husband’s idea. I think we were sitting out on our deck one afternoon and Jeff was making a fauxhawk on Tiffany’s head with a bit of water and it looked really funny and cute, so we took it from there and colour just seemed to the next option to make it even cuter! Do people ever cast judgement on you? Not outwardly, we’ve never had an outright negative reaction. How do you respond? It would depend, if it was constructive, as in, we shouldn’t have cut our Pom’s coat down, I’d have to agree. Grooming a pom short can cause reverse grooming alopecia or in Tiffany’s case seasonal alopecia (she sheds her coat in the summer and it doesn’t grow back) in the winter however it comes back in and she gets fluffy again. If the judgement was that they don’t agree with dressing up a dog or putting sunglasses on her, I’d say that’s your opinion and you’re entitled to it; they would have to see how excited Tiffany gets when I get her hoodie out and she knows she’s going out. And we put the sunglasses on her and she’s happy to keep them on – as long as dad is carrying her – she knocks them off mostly as soon as we put her down on the ground. We’d never force our dogs to do anything. We have other dogs at home, and they do NOT get excited when a hoodie comes out and would shake the sunglasses off as soon as they were on; so we don’t do that with them. So we leave it up to Tiff. If she’s happy we’re happy. Obviously I am a huge fan of purple, I designed my marketing around it. What made you choose that colour? It was our groomers suggestion; we had done pink at first, but it was too light, and we tried green, but that just didn’t seem Tiffany. We tried the purple and voila! A star was born LOL. Will you keep doing this for her? Yes, as long as she is ok with it. She makes so many people smile, it’s just so wonderful to see. We’ve seen grumpy kids light up when they see her. People who are barreling down a street lost in their own thoughts will suddenly stop, smile and say hello. We have met so many wonderful people because of Tiffany; we get to hear about their dogs and their stories; some happy, some sad, but there is always a connection. Because she’s so gentle and docile; children of all ages can pet her and learn about being gentle with animals. Some people will just stop and laugh which is the most wonderful thing to see. My face always hurts from smiling at the end of the day. Anything you want to say to people thinking of giving their dog's a dramatic hair style? As long as your dog is ok with it and most importantly it’s not harmful or hurtful to your pooch, why not? Having been to two of the AGO’s first Thursdays events now, I feel I am more or less qualified to write a review of the event. Despite being run since 2012, I certainly had no idea that this event existed prior to this year. I naively believed that the ROM was the only cultural institution in the city trying to engage other demographics. Not unlike the ROM’s Friday night events, the first Thursday of each month is an opportunity for the culturally aware to partake in a night of music, spoken word performance, visual art and, of course, drinking (sorry under 18s). The theme of this month’s event was “Outsiders, Outlaws and Poets”, to coincide with the new Outsiders exhibit. It is most definitely the busiest I have ever seen the AGO, with the majority of people concentrated somewhere around the two main bars, offering a selection of gourmet late night snacks and drinks, for a price. There is little opportunity for good conversation, so I don’t suggest you take a new date here. You’re also apt to lose them in the crowd! The second most popular area seems to be the interactive spaces. At the April event, this was situated down the hall from one of the bars, and allowed everyone to color and stamp their own buttons. It was quite the popular activity, so naturally I just watched from afar to avoid the hordes of young adults making their own buttons. Still a little sad I didn’t shove my way in though! At the March event, there was a space in one of the gallery wings to color postcards with various images of Toronto streets and skylines. This elicited some varied results, with mine staying entirely blank whilst my companions became a beautiful rainbow of colors scribbled across the image. Goes to show you that I’m definitely one of the people going to observe art, not create it! And what a variety of art there is. Aside from the traditional gallery fare open to be explored after hours (which elicits some “Night at the Museum” type excitement), there is a variety of spoken word, music, discussions and installations to visit. Scattered around the second floor were presentations about the new exhibit at the AGO, Outsiders, and some very talented spoken word artists reading poems, novel excerpts and the like, providing a more culturally significant sonic backdrop than the chatter and laughter of young couples and friends exploring the gallery. The event also features a variety of musical talent that tends to draw a crowd just off the first floor atrium. This month, the acts were Carole Pope and the She Devils, although I was only able to stay awake long enough to see the latter. The ambient lighting and sound helps to create an atmosphere that made me feel like an outsider in the best way possible. To me, it was about people that don’t quite fit the mold but have so much to offer, the way I think we’ve viewed many creative people over the years. As a twenty-something, it seems I was the prime audience for this event. Most of the people wandering the gallery were other young adults, perhaps those who don’t typically gravitate towards visiting the gallery, but were enticed by the after hours’ drinks and unique experience that I don’t think we typically associate with art galleries. It’s quite an interesting concept, to create a unified cultural experience within one space that I think many of us forget about, or maybe don’t associate with exciting contemporary culture. It brings together so many different demographics into one space. While I prefer my art in a quiet gallery, not navigating hordes of people, not quite so late at night, and the ability to explore the entire gallery (although I am now very well acquainted with the main and second floors), I definitely see the merit in events like this. It’s a great way to experience the AGO if you’ve not been, and the idea of going to “just an art gallery” bores you, and an excuse to get out on a weeknight with some friends or your significant other. I hope to see a great deal more of these aggregated cultural events in future around the city! Does your pooch ride the red rocket? So I took my dogs to a park this weekend since Sunday was a beautiful sunny day and as I was waiting for the bus a lady asked me if dogs were allowed to ride it, and then I wondered… Do Torontonians know how the laws work for our little ones regarding the public transportation? I have only been here for 7 months and when I have first arrived I was amazed when bumping into some pooches while on the subway, but now is so already on my routine to see this and also to take my dogs with me everywhere I can that it comes as a surprise to find out that there are still lots of pawrents unaware of this ease. According to the TTC, pets (dogs, cats, bunnies and other small rodents) are totally allowed to ride on buses and trains if properly leashed or crated, and respect the peak hours during weekdays, which means: no pets allowed from 6h30 am to 10h am and from 3h30 pm to 7 pm from Monday to Friday. On weekends and holidays pets can ride normally at any time. The exception to this rule is for Service Dogs*, which are allowed even at peak times. It is important to note, however, that on Go Buses and Trains your pet need to be crated and do not bother the other passengers. Also, even on regular buses the driver can refuse to let you in if he decides the vehicle is already too crowded, although this is a common sense matter. So, now that you know your furriend can ride the subway with you, you can start planning where to take her for a walk. I’m pretty sure she will love it! At least some raccoons do. It all started with drawing the Sunday comics as a child. My name is Elsie Chiu, a self-taught abstract artist working primarily with acrylics on canvas. My love for art started at an early age. From as far back as I can remember, I’ve always had a passion for drawing and painting. My favourite pastime as a child was drawing the “Sunday Comics” which brought me great joy. This year (2016) I followed my heart and took a leap of faith by leaving my corporate job to pursue my passion for painting full-time. Painting exhilarates and grounds me at the same time. It allows me to connect with a deeper part of me, giving a voice to my emotions. My experiences fuel my creativity. My inspiration and influences come from the world around me. It comes from everything I feel, see, and hear. I am inspired by the sound of children's laughter, the beauty of rain falling against a window pane or the colours and flow of graffiti on the side of a building. When I paint, I am drawn toward undefined “accidental” brush strokes and bold splashes of paint. I combine these with layers of paint creating thick textures with organic flow giving my paintings energy and a voice. I will be exhibiting my paintings at the Entertainment District Art Crawl on July 8, 2016. I invite you to come see my work and experience what I feel. Seven Toronto dog celebrities you'll want to follow! Does your pooch have his or her own Instagram account? These days, that is not so surprising. There are thousands of amazing dog Instagram accounts, and this is in no way a top 10 list. These are some local Toronto pooches being showcased. If your pooch has an Instagram, be sure to leave their username in the comment section – there is no such thing as too many dog Instagram accounts! These 3 stole my heart, to the point where I became somewhat of a stalker (it totally paid off, because now they are all my bffs on and offline). They all have such distinct personalities, and their posts will melt your heart. Just to give you a taste of what to expect, Kimchi calls herself the ‘Beyonce of Corgis’. So yeah, you're in for a treat. Tiffany is the raddest and most microscopic sweetheart in the GTA. She is at all the pet themed events in the city, and is guaranteed to make you say “awwwwww”. With a bio that reads “the most interesting dog in the world” you know you are in for awesome posts. All the photos are professional grade, and just so adorable. Rupert Allan @rupert_allan_the_bulldog (125+ followers). What isn’t to love about a bulldog with an extreme under bite? But, that’s not the best thing about his Instagram. Rupert posts relatable memes that sometimes make you forget that he is a dog, because really – he is one of us. Why this dog has over 20,000 is pretty obvious – just look at that tongue. But seriously, Oscar’s posts are relevant, funny, and even informative. Definitely a city dog, just looking for love. Dean is in the big leagues when it comes to instagram fame, and really just internet fame. He has written articles for buzzfeed (http://www.buzzfeed.com/samimain/all-about-dat-basset#.nfyyrQEoE), so not only is he adorable, but he is intelligent and a better blogger than I am! I grew up with golden retrievers, so I am a total sucker for them.. but something about Murray just makes you feel warm and fuzzy inside. His posts are like drinking a warm cup of hot chocolate on a cold winter day. It is endless – if you are looking for more dogs to follow, go to my Instagram (@dogsworldTO) and look at who I am following, because it is 99% dog accounts. You will see bernedoodledash, _dieselthebugg, porterinthecity, and so many more! Like I said, if you have a doggy Instagram, please comment below and let us know who you are – so we can follow you. My favourite part of dog instagrams is seeing doggy friendships form. The Canadian Pet Expo was this past weekend, and the number of “I can’t wait to see my bff ________ there” posts was truly inspiring. Pampered Pooches is just around the corner, so why not form some awesome internet friendships and aim to bring them to life on May 7, 2016 in Liberty Village. It really is a Dog’s World, isn’t it? My name is Nadia Lloyd, I'm a self taught abstract artist, designer and event planner. In 2010 I sold my fitness boutique studio in the east end, picked up a paintbrush and started painting for the first time. It quickly became a passion and obsession and a full-time venture. By 2012 I started printing my art on different textiles to experiment with various home decor and fashion accessory products. I had a wish and desire to make my art functional, accessible and affordable, and I couldn't think of a better way than to print it on a pillow or a pair of leggings or skirt, so that's what I did! After a few years of experimenting I have four primary collections including cushion covers, scarves, leggings and skirts. My cushions and abstract art have been carried by retail stores such as Casalife and UpCountry and my scarves are available at the McMichael Canadian Art Collection Gift Shop in Kleinburg. My collections and original abstract art are all available online at www.nadialloyd.com. When I'm not painting and designing, I'm event planning. In June 2013, I ran an event I called the Liberty Village Art Crawl. I gathered 45 artists, 2 food trucks and a DJ at Liberty Park in Liberty Village for a full day of sun, food, shopping and catching up with friends and neighbors while supporting local artists and artisans. The event was hugely successful, went without a hitch and was very well received by the community. Following the event I was approached by other community leaders asking me to organize a similar event in their local communities, an offer I could not resist, and within months I became a full time event planner! Before I knew it, I had 5 annual events happening in three separate locations on an annual basis, and it was time to form a parent company that would oversee all of the events. That is when Toronto Art Crawl was born, in the early months of 2014. Since then, Toronto Art Crawl has been named "Top 10 outdoor art fairs to attend in Toronto" 2 years in a row by BlogTO (2014-2015) and has been presented by Cirque Du Soleil Luzia, Varekai and Toruk (2015-2016) and sponsored by companies such as BMW, Mill Street Brewery, Zipcar Toronto, Investor's Group to name a few. So needless to say, you NEVER know how a tiny idea can grow into something way bigger than yourself! Even though it can sometimes be challenging to juggle art, design and event planning on a daily basis, the three are true labours of love, and I get so much joy and energy from them - it feels like play more than work. My advice on harnessing creativity is just to be as creative as possible, as often as possible. I find the more I create, the more I create. I've come to the point where I need to create on a daily basis in one form or another. People often tell me that they're not creative, and I don't believe that one bit. I didn't discover my creativity till I was 35! I never went to art school and didn't really paint as a kid. So this was a truly strange yet welcome discovery for me. And it can happen to anyone. So my advice is like Nike says, JUST DO IT! Get out there and create. Do what ever makes your heart sing. "What inspires me the most is colour. Colour combinations found in nature; colour palettes designed to calm the senses; colours that attract us and give joy", Sandra Negrete of Nocturnal Blue. Curious to see her collection? Follow on our Facebook page for updates here! "This playful selection of greeting card images are digitized versions of my original paintings. I love this process because it allows my imagery to be printed in a variety of ways. What's thrilling about working this way is that it makes my original artwork ACCESSIBLE, AFFORDABLE and FUNCTIONAL. From birthdays, anniversaries, holidays to house warmings, there is an image for every occasion! ", Jamie Ashforth, see more here! Curious to see her collection? Click here! "the magic we can feel everyday, people surrounding me with their different stories, my personal life journey and nature", Svetlana Gayvoroskaya of Illusori. Meet Svetlana and view her collection at our Christmas Market Nov. 22nd! Follow along on our Facebook event page HERE for previews of our featured artists! "...the deep serenity to be found in nature, in contemplating the patterns in a fallen leaf or in the graceful curve of a blade of grass. In that stillness you can rediscover what is truly important in life and in the world. I largely draw my inspiration from nature, using its shapes and patterns as the basis for my handcrafted, limited edition art prints and fine art photography." Deb Richardson of Parchment Moon. "I worked in the music industry most of my life. We would all joke that we needed a plan B as digital became more a part of life... photography was my plan B. Actually it was always my true love, but I didn't think I could actually make a living at it! About 3 years ago I was laid off and instead of getting another J-O-B, I started living my dream. I rented out my basement apartment, I board dogs for people when they go on vacation through my other company Stink Eye Dogs and I get to make art for people to hang on their wall... life IS good!" 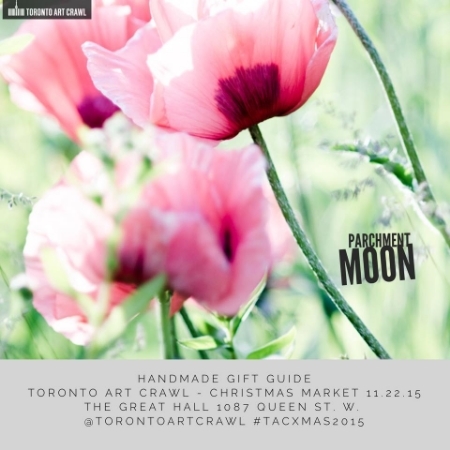 Meet @lorieslaterphoto November 22nd at the Great Hall Christmas Market! that every new plate I find and deface with something silly, rude, or subversive, is unique. It's never boring, because there are so many awesome vintage plates, and so many ways to turn them into something new, Anna E. of lousongmade. View Anna's collection and 64 other amazing and inspiring artists at our Christmas Market, November 22nd at The Great Hall! Join our Facebook event page HERE!